​CRAFT is a research project with the intent of creating a platform for supplying designers with fast and effective crowd-based feedback. Initially conceived to build upon the existing structure of CrowdCrit, CRAFT is meant to address the omnipresent need for high-quality feedback within the space of visual design, while still maintaining the speed and quantity of response intrinsic to crowdsourcing. The service largely targets students and novice designers, while still aiming to remain flexible and robust enough to appeal to experienced users. Initial work on the project entailed coming up with initial design constraints and goals, wherein the need to provide context for a given design iteration becoming apparent early on. This manifested in early sketches, where Ryan Brill, Rachel Jue, and I worked to cultivate early ideas for what CRAFT might be able to do. The creation of these wireframes allowed me and my team to solidify the design goals for which we were striving into concrete features. Chief among these included a timeline of iterations, with the goal of providing crowd workers with expanded context for a given project. With this and a few other features in mind, we set out to design a study to verify whether our suppositions about whether extra context would actually yield better feedback. An example of a piece of feedback returned to the students. 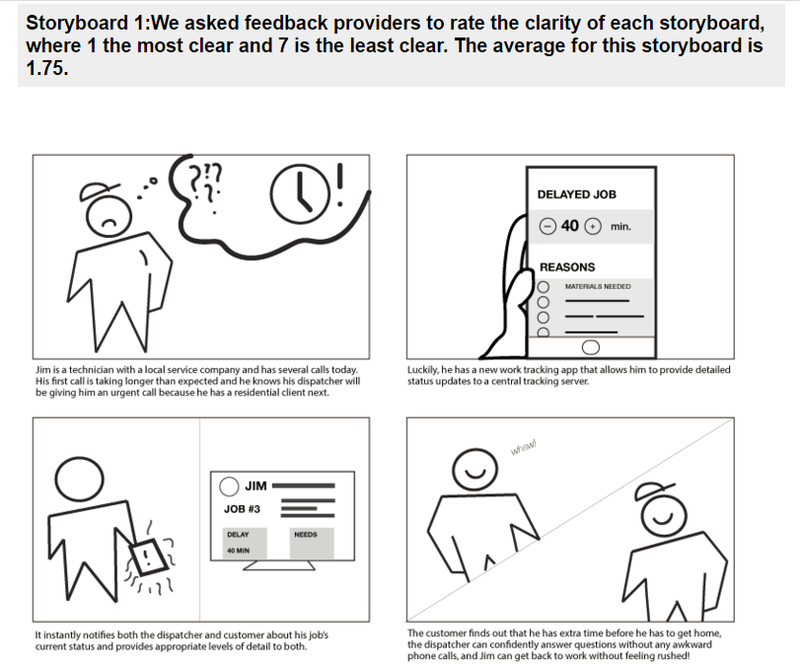 The study design involved requiring students in an introductory-level service design class to submit early storyboards for a design project.These storyboards were formatted in such a way that they fulfilled a few key design considerations for CRAFT, including contextualizing previous iterations and scaffolding novice designers about how to ask for feedback. These new, formatted documents were then submitted to Mechanical Turk workers for feedback. Designers were provided with a general clarity rating, as well as textual feedback on each storyboard. The results of this study are still under review, and will be published in a forthcoming paper. However, they have given us the insight necessary to move forward with the design process. With sufficient research justification for our design considerations, the next step forward entailed mapping a user journey, as well as a potential interface for the service. Initial work on the user journey required that we conduct interviews of design students and review existing feedback literature, in order to best lay out what the process of using CRAFT should look like, for both both designers and feedback providers. By defining specific points within this journey, we are able to better focus on which aspects of CRAFT as a platform can fulfill which design motivations, and from there, how we can create an interface to suit those needs. We are currently working to compile the information gained from creating these user journeys into a general review of the crowd-based design feedback space, which we aim to publish in a second forthcoming paper. From the user journey, Eureka and I were able to identify specific areas that were deemed valuable for meeting our established design goals, specifically including "displaying messy designs" and "giving quality feedback." From here, we worked to create sketches of potential features which we believe to meet these needs. Much of my work involved the design of a system that would allow designers to create rubrics for crowd workers to use during their review process. The idea behind this feature is that many novice designers struggle with the topic of knowing which questions to ask of feedback providers; within this interface, users would be able to use other users' rubrics as scaffolding for their own. Interactive digital wireframes of this feature can be found here. Design and development of CRAFT is still ongoing; our next steps are largely reflective, with many of the above steps yielding excellent research artifacts and interesting insights into the domain. However, design of the system continues, with the intent of launching a proper prototype of CRAFT before the end of 2016.